It’s always lovely to see the polished and beautiful rooms in a design magazine. 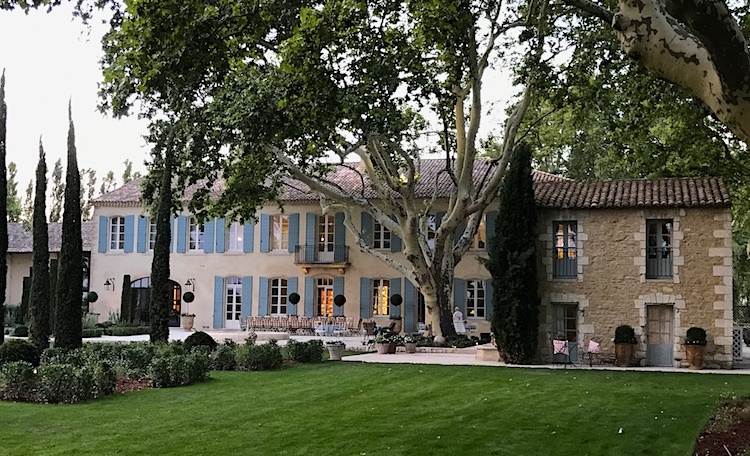 Take our recent Provence, France project for example, which was featured on the cover of Veranda Magazine’s March/April 2019 issue. This project looks stunning in the pages of the magazine, but it takes a lot of hard work to resource for furnishings, coordinate the installation and carefully consider and place the artwork and accessories. 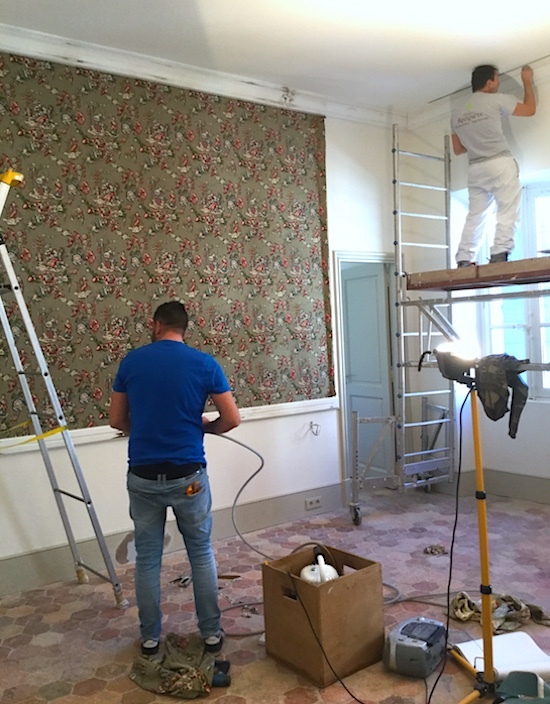 I wanted to show you a behind the scenes look at our enormous coordination effort that got the rooms at Le Mas des Poiriers looking stunning and photo ready. 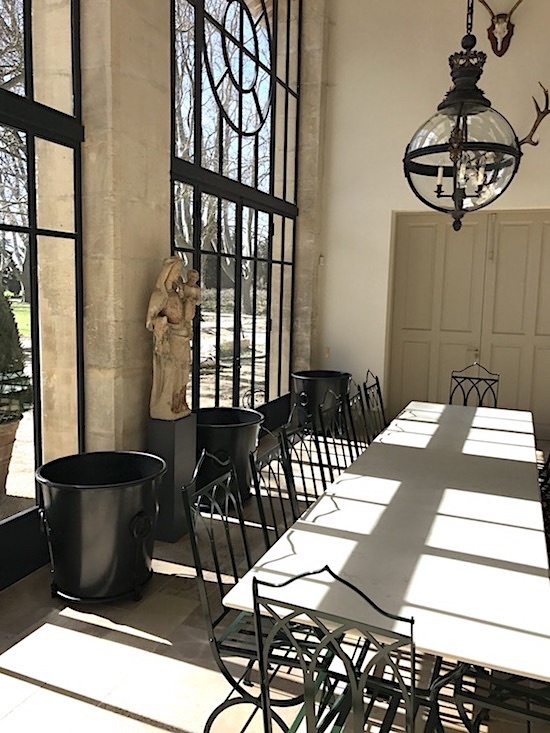 You can read about the renovation that set the stage for this final phase at our blog post entitled Dream Project: Le Mas des Poiriers – Avignon, France. 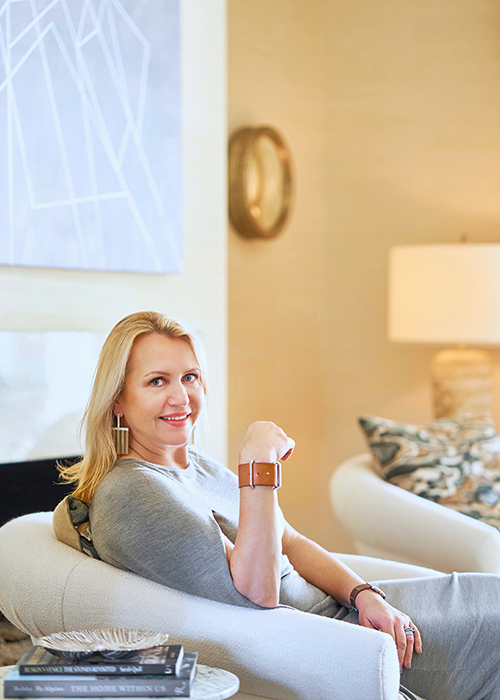 Would you believe my client and I collectively found and installed all the furnishings – furniture, art and accessories for this 10,000+ square foot home in a year and a half! 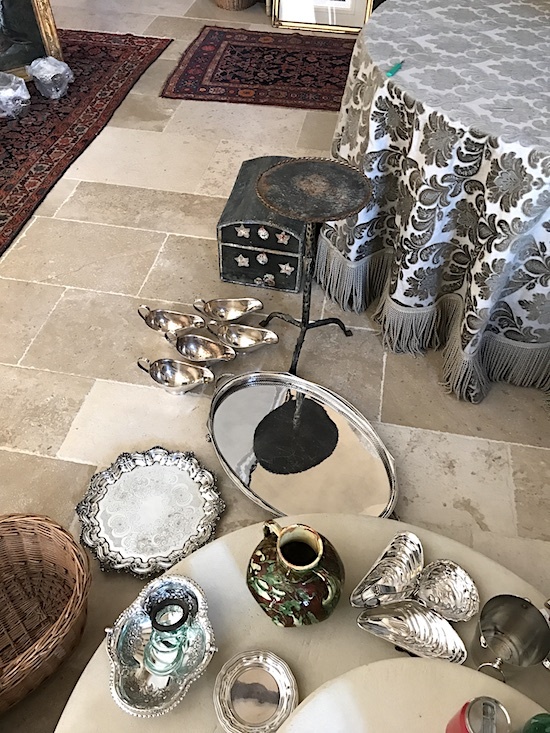 There were many trips to the local antique markets at L’sle-sur-la-Sorgue in Provence, Paris shops and Flea markets; we also scoured selected vendor sites for just the right piece. With a house this large and an aggressive timeline, my first step was to determine the furniture layout for each room and indicate the ideal size. Because most European vendors work in metric, we marked each furniture piece on the plans in centimeters. My tape measure with centimeters and inches side-by-side was a lifesaver on resourcing trips. The Units Plus app on my iPhone to convert centimeters to inches and our detailed Google Doc spreadsheet of all pieces needed by room was also essential to keeping us on track. 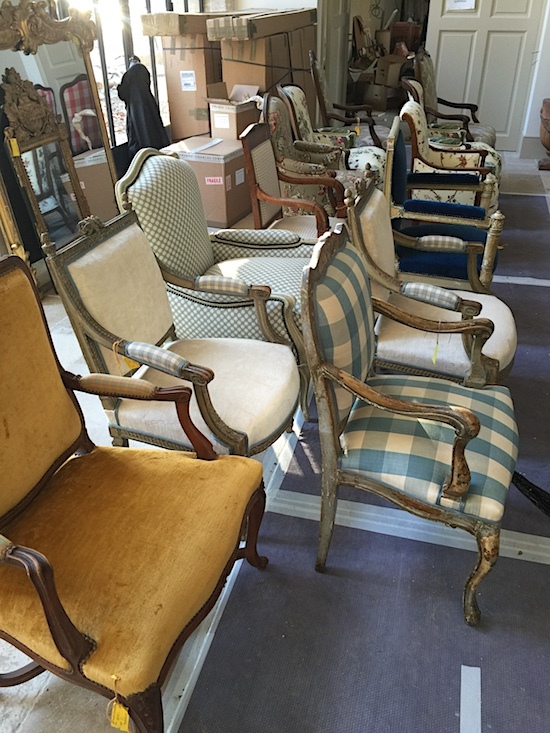 All of our furniture from Europe and some furnishing we had made in the US were collected and shipped to a local warehouse in Marseille. We coordinated with them to ensure all pieces were categorized and damage free. 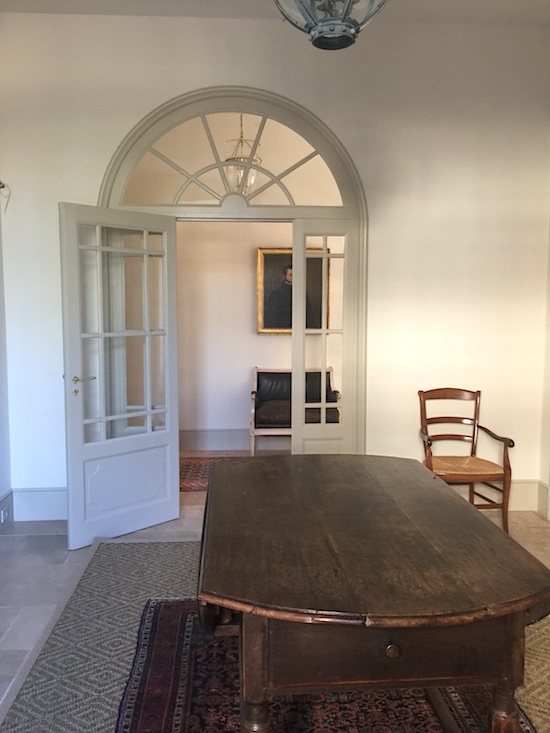 The installation of the furnishings took place over about 10 days. With our detailed spreadsheets of purchased items and our scaled furniture plans taped to the wall in each room (and lots of coffee and energy drinks) we worked to install the expansive Mas. I requested rugs and large furniture to be on the first truck. Small accessories, artwork and lamps on the last truck. 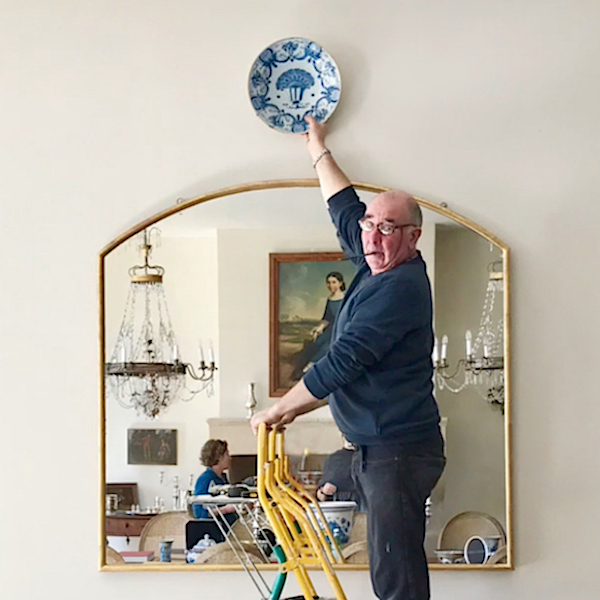 While the skilled drapery workroom labored to install the custom testers and draperies, we oversaw the movers to place each furniture piece according to our scaled plans. It was hard to communicate, as most of the installation teams did not speak English and technical terms were lost in translation. Luckily for us – one of the movers was English and fluent in French and became our job site translator. That was a lucky break! While the movers worked to assemble beds and lamps, we moved to the smaller details. I believe, no room is complete without artwork and accessories. I credit my time working at Ralph Lauren decorating their luxury flagship stores with this layering approach. Since this was a vacation home for my US clients, they did not have any collections at the onset of this project. However, they wanted finished spaces to enjoy immediately once the renovation was complete. We worked diligently to find pieces to furnish the home and give it that classic French feel. 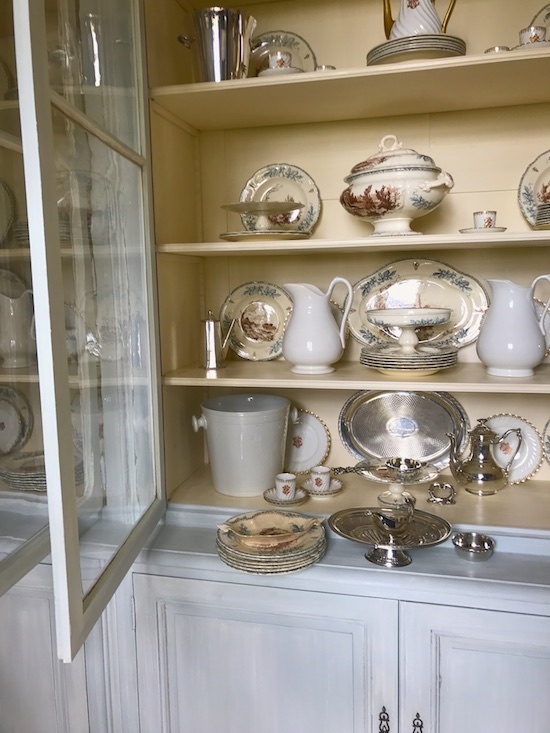 Careful collecting of silver, china, artwork, statuary, antique books and other small accessories are what rounded out each space and created warmth, interest and a feeling that this home was collected over time. 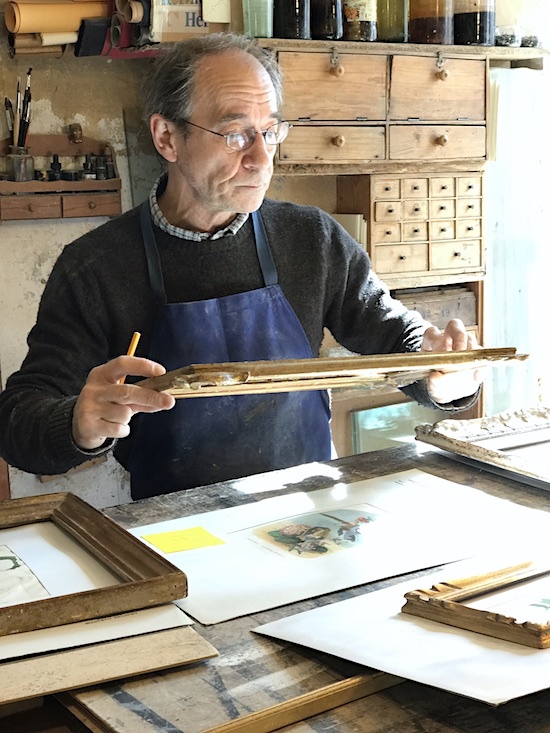 The Provence framer working in his charming shop to frame our Paris Flea Market finds. 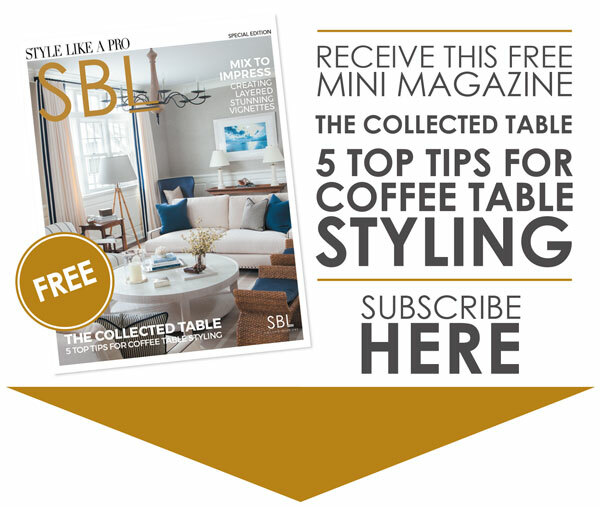 I thought it would be fun to show you a few rooms below – before and after our final styling, and give an overview of what we did and why. Seeing the impact that professionally installed accessories and artwork have on a space is remarkable. 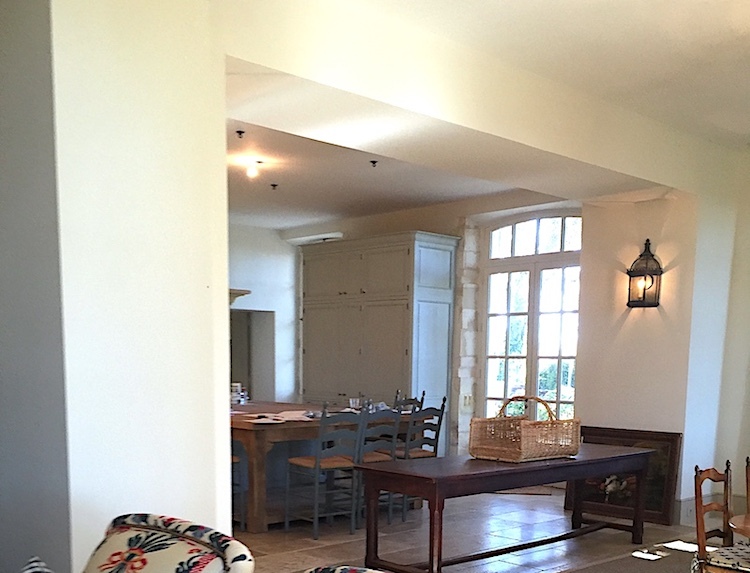 Our Design Challenge: make this enormous room cozy and maintain the casual Provençal feeling. Of course, hanging plates on the wall was a big part of our design strategy to fill the space and make it feel warm. 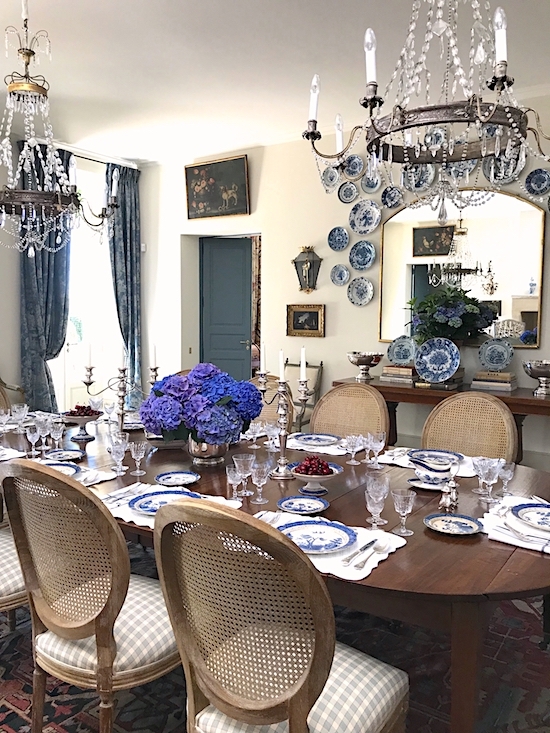 Adding to the blue tones in the Pierre Frey fabrics and steely blue paint color on the doors, we introduced Delftware and Faience and other china patterns on the tables and in the display cabinet. 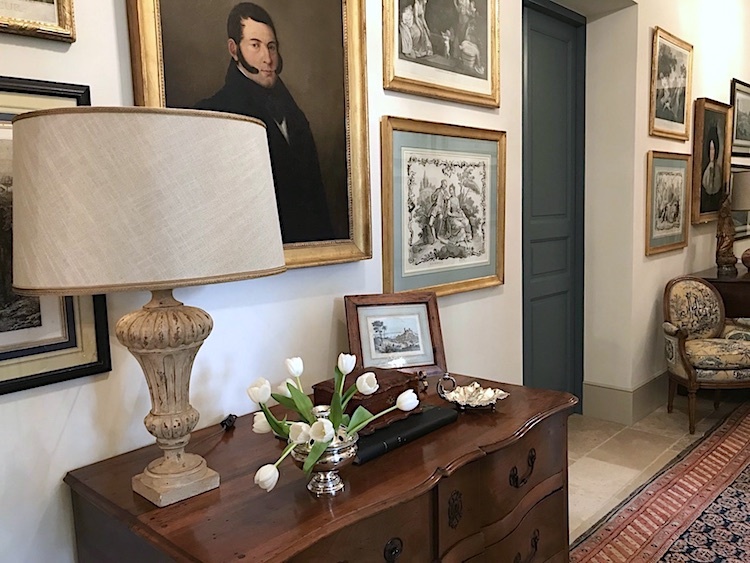 We organized smaller “moments” throughout the room to give the eye a place to travel – from the bust on a pedestal, to the small groupings of oil paintings and sconces, to the collection of blue and whites around the large mirror. Fresh blue Hydrangea flowers added the final decorative element. The addition of this space to the house was suggested by Alexandre Lafourcade in the renovation of the Mas. Historically, these rooms were built in fashionable homes in the 17th-19thCentury and used to protect fruit trees in the winter months. Our clients use this space for indoor/outdoor entertaining just off the Grande Salon. My Client found this lovely stone statue that sits between the windows and it sets the tone for this classical space. 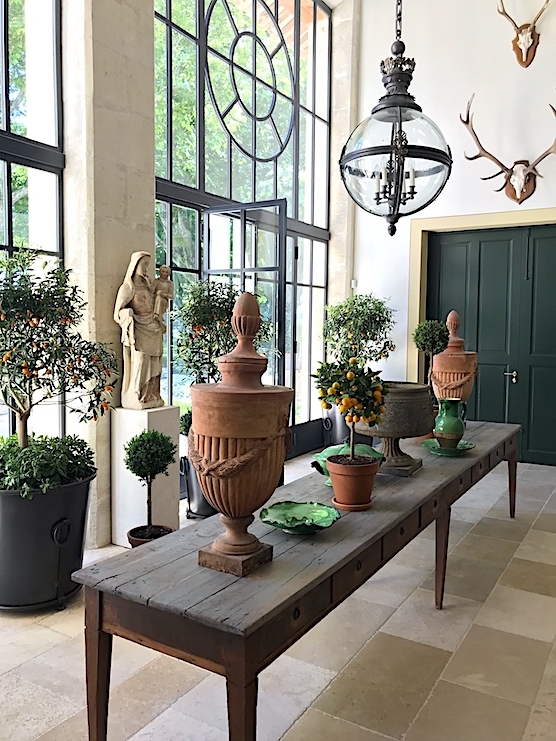 We filled the room with a 13-foot long rustic garden worktable and oversized painted Hervé Baume planters filled with Kumquat trees. In addition, we wanted a few bold decorative statements in the room to work with the lovely antique statuary and foliage. Anchoring the table is a pair of antique terra cotta jars we found at a local dealer. The burnt orange tone adds a great contrast to the green foliage. The added vibrant green glazed pottery and commanding antler mounts on the wall complete the rustic/refined balance that we wanted for this traditional garden room. The Kitchen was another large space challenge. The oversized reclaimed Oak Island’s warm tone was a great foundation that we built on. We added a custom pot rack above to make the room more intimate. The collection of copper pots is handy for the chef, but also creates a cozy feeling. A series of glazed yellow pottery was carefully placed on the large island to feel random and casual. In the pottery we added live herb plants and cooking essentials. It looks pretty, but is also functional. The walls are adorned with a ensemble of decorative plates and small still life paintings found at the local market. 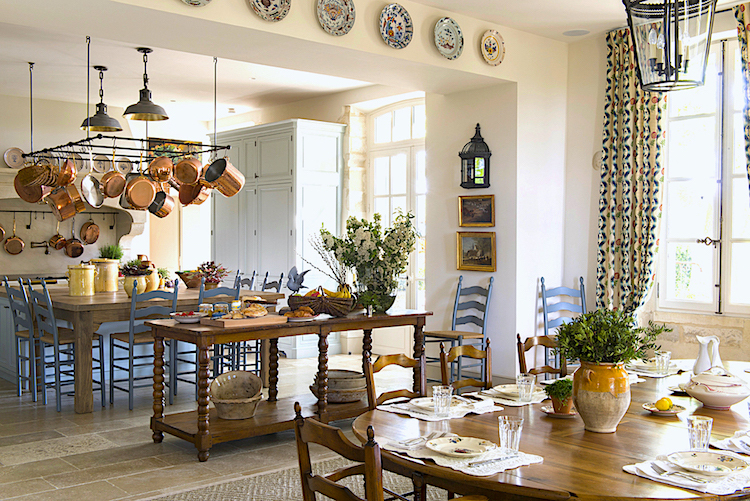 The antique narrow turned leg table between the large island and breakfast room is styled with wooden bowls, rustic baskets and cutting boards for gourmet breakfast presentations. The simple large blown glass vase is filled with fresh cut branches from the garden. The quickest way to make a space feel interesting and alive is to add fresh cut branches and potted plants. 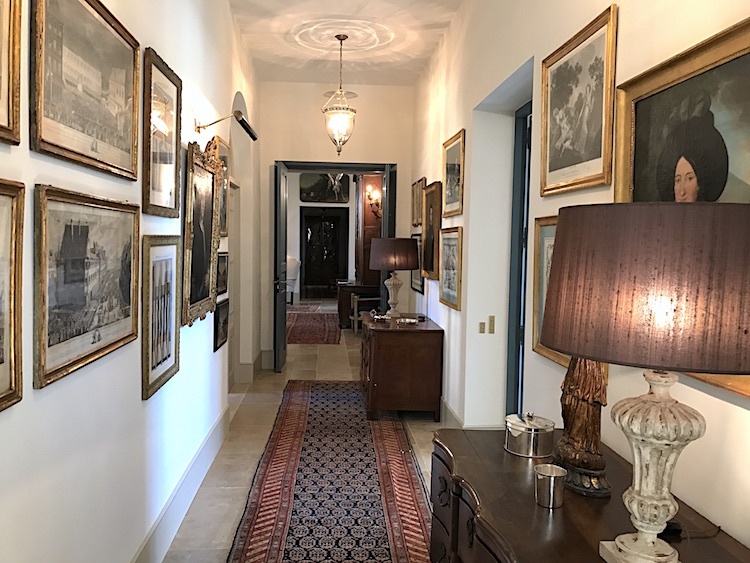 This long hallway connects the main entry with the Orangerie. It seemed the best place for a gallery wall of artwork as we had not done that anywhere else in the house and I love the look. In keeping with the classic interior, we shopped for French etchings, maps, prints and oil portraits. I decided to add two complimentary commodes around the doors to the Grande Salon to establish the importance of the doorway on the hall. We used the chests to focus the artwork groups on that side of the hall. On the opposite side, we strategically added a picture light over a key oil painting that was centered across from the Grande Salon’s blue double doorway. There is a careful rhythm of artwork down the long hallway. Lamps and small silver accessories on the chests add the final visual touch. 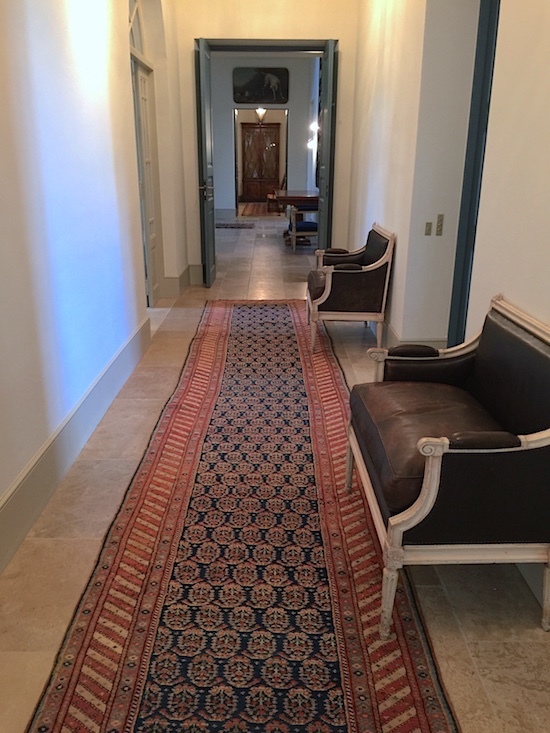 Accustomed to functional Mudrooms in the States, this space was a request of the Client. Located off the motor court and equipped with a wall of storage cabinets and a sink, it has practical uses. Though it’s a workroom, it also off the Gallery hall and right across from the Grande Salon, so it had to be beautiful. We made the generous space feel like a pretty sitting area. 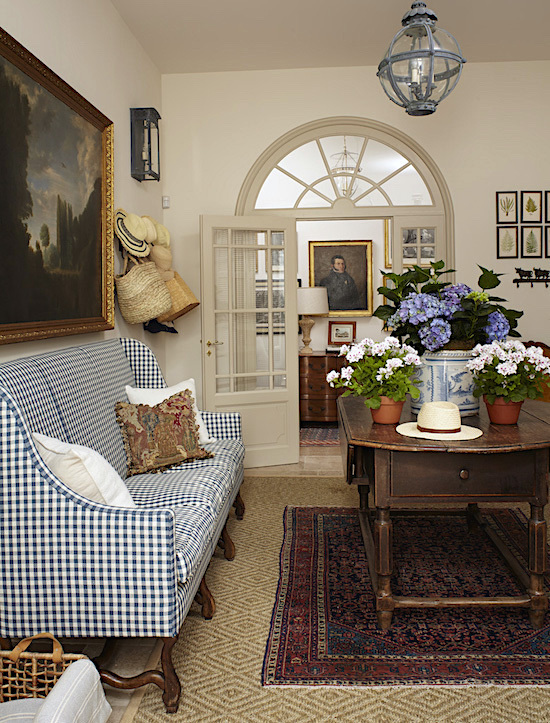 The sofa has a casual elegance in its ocean blue gingham. The center drop leaf table has a fresh flower arrangement on it at all times in a rare antique Faience tub which looks great with seasonal flower changes. The rustic table can easily be cleared off and used for potting flowers or packing for a day at the Mediterranean. A few key styling details: We adding custom iron wall hooks so we could layer baskets, hats and bags to this casual reception room. Also, to ensure the room felt elevated along the formal hallway we hung a large pastoral oil painting above the sofa. This installation was an intensive week of working on our feet 8 hours straight. As hard as it was, I’m thrilled with the final result and enjoyed the experience of working in France. 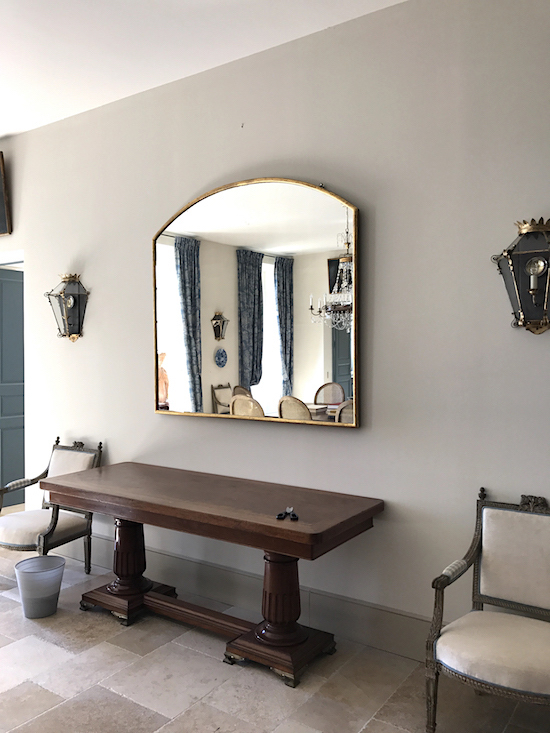 If you liked reading about the before and after of these rooms at Le Mas des Poiriers, please check out the post Before & After: Designing a Romantic Guest Suite in Provence for more before and after on my Provence project. Thank you Holly for your kind words. We worked hard to find just the right pieces for this home. Sue, this is amazing work! You re-imagined a beautiful and livable space all in one. I can’t wait to see what you design next! Gorgeous. Decorated with grace and elegance!!! So kind! Thank you Ruth!